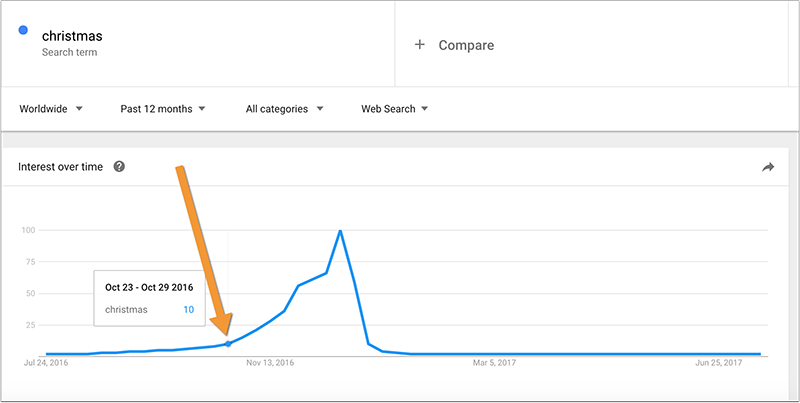 I spoke on seasonal trends and how they affect SEO and hence content marketing strategy at Pubcon last year. While preparing my deck, I decided to create a list of resources here to make it easier for Pubcon visitors to get a neat overview of everything they need to get this content strategy in action. This may turn out to be a useful reading for this blog visitors too, so everyone wins! 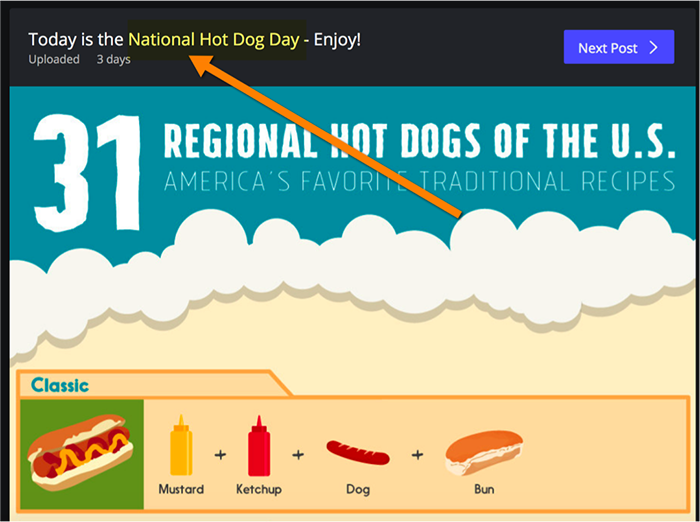 Why use trends and seasonality in content marketing? 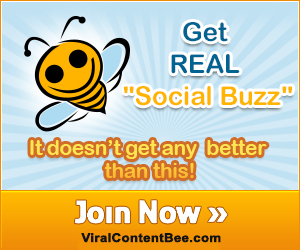 When to publish content to catch the annual trend? Timing is everything: Giving people what they need at exactly the moment they need it is probably the most effective way to get that visitor convert into a customer. It’s also a great way to get that visitor share your content with their friends and thus bring more future customers to your site. Hulu.com launched their advertising campaign right before the launch of the Super Bowl, and the site’s traffic increased by about 50%. A timely hashtag marketing campaign resulted in Vodafone’s sales increasing 27% compared to previous year. These are the trends that you can foresee by doing some basic research. 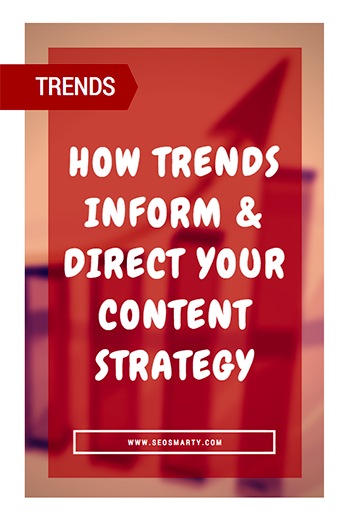 The good thing about these trends is that you can plan your content marketing campaigns one year in advance to target these trends better. Time-based (winter=flu season, ski season, etc.). These are pretty obvious and you don’t even have to be long in the industry to guess them. Simply use your common sense! Here’s a good example of season-based timely content: Keep an eye on the publication date for this one. The idea is, people plan their winter vacation in mid-open, so that’s where you catch the wave! Country- / city-specific. Depending on how local your business is, you can target these events as close to you as you, for example this could be your town day. Weird / funny / special days (National Cat Day, National Hotdog Day, etc.). Try DaysoftheYear.com to find those. Planning content for the whole year is overwhelming: You are likely to have too much to think about. 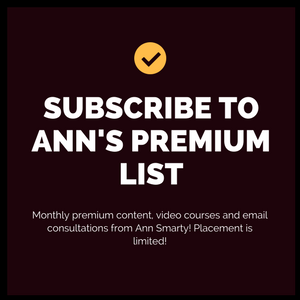 Get a bird’s eye view of your upcoming year content marketing plans: Creating an editorial road map is a good first step and you’ll be able to reuse it next year for the most part too. >>>You can easily make yourself a copy of this template here. 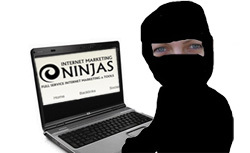 Content Assets: infographics, pdf whitepapers or ebooks, etc. This is a great time to start fostering expectation. 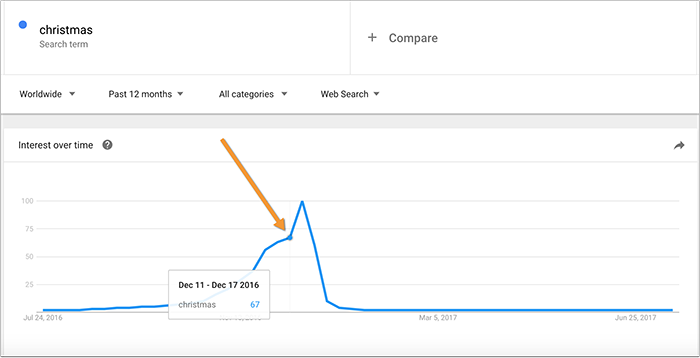 Looking at the screenshot above you can tell with some level of certainty that the interest in Christmas starts picking up at about late October. This is where you can start preparing for the trend. Your preparation period may include content brainstorming, content research, outreach strategy outline and more. 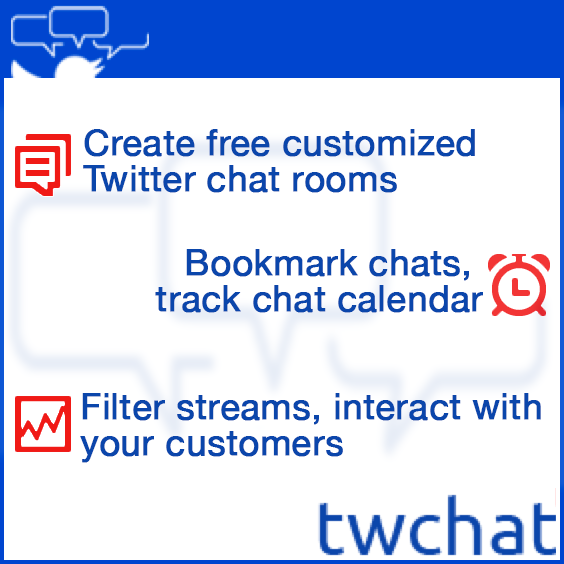 You can also start posting on social media hinting that something big is coming to spur some more interest and collect more subscribers. Finally, the pick is around December 11-17: This is where you publish your cornerstone piece, start actively reaching out to influencers on social media to help you promote it and invest in social media ads. You own a playground equipment business, so your target audience is school teachers, camp owners, etc. Moreover, your other important target audience is parents because they can influencer your future customers. On top of that blogging parents are your “linking” and “sharing” audience too. Because content marketing is mostly about influencing the influencer, you decide that your Christmas content asset will target your secondary audience, i.e. parents. 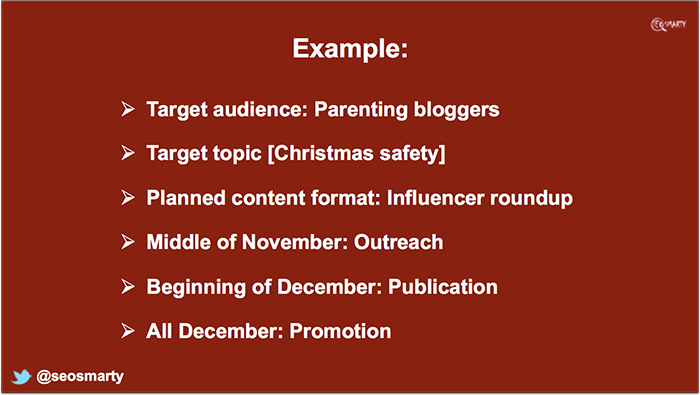 With that in mind, when planning your editorial road map, you discover that that “Christmas safety” is one topic not many parenting blogs cover, yet there’s a huge potential: It’s more or less easy to rank for and it’s something no parent will want to miss, so it will obviously attract shares and backlinks. Quick note: People start putting up Christmas trees on December 1, so technically you are good to publish it at the very beginning of December. 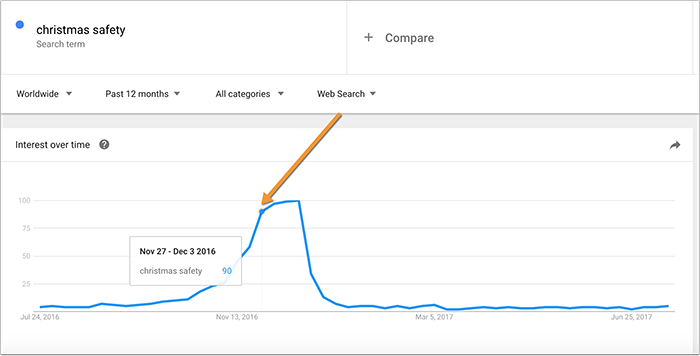 For other topics (like Christmas recipes) you may want to catch the later trend. As you can see, timing may also vary a bit from topic to topic but it still falls into the major trend dates. In other cases, you’ll need content right when it happens but you still need to lock the preparation and promotion timeframe in your calendar. For example, if you cover fun holidays, you are most likely to need that content on the actual day of the holiday. If you plan more than 5 articles ahead, you’ll need an editorial calendar. If you work with writers, editors, designers and social media marketers – all working on one bog of yours or your clients, you must have an editorial calendar. I never start with editorial calendar (because it’s just overwhelming). 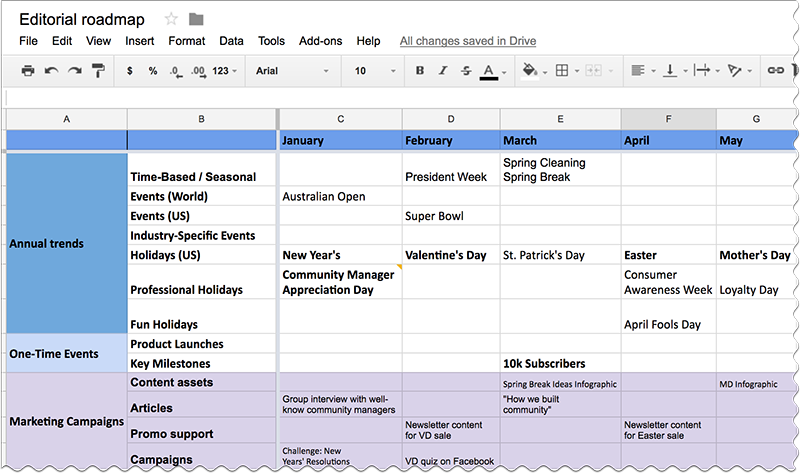 Instead, I start with editorial road map, expend it with keyword research and only then put together a calendar. Otherwise, I’ll be overwhelmed. 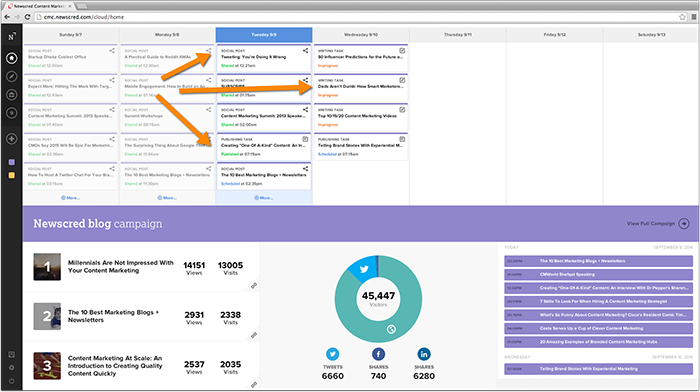 I’d love to hear more on the topic: Do you use seasonal trends in your content marketing? Please share your thoughts in the comments! Hi there, Thank you so much for informative information. I will follow your instruction. Very interesting article @Ann_Smarty. 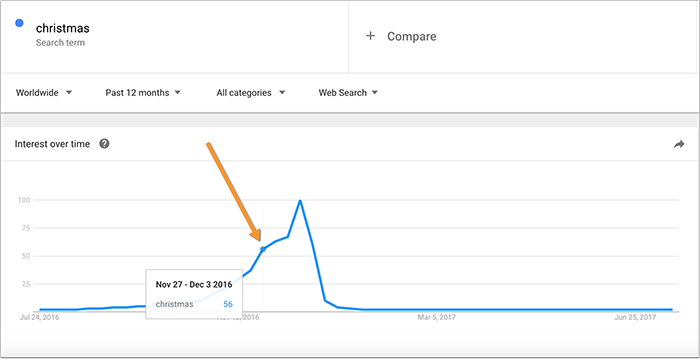 Google Trends is very useful in finding seasonal trends beforehand. Pretty cool. I generally focus more on evergreen content since I own a personal finance and self improvement site, but publishing seasonal content is still worth considering. For now, I only make seasonal content for Christmas (holidays, spending time with family, vacation, etc.) and New Year (new habits, self improvement, etc. ).